Despite being interested in Zeboyd Games, I’d somehow avoided playing anything released under its auspices until Cosmic Star Heroine received a Vita version. The experience definitely cemented my desire to continue seeing what else Zeboyd has released, but did not blow me away with a level of hitherto unseen awesomeness. This is a good game with quite a bit worth seeing, and for the Vita a couple of additions were made to elicit interest even from veterans. Just keep expectations at the appropriate level without anticipating that Cosmic Star Heroine will quite achieve everything it tries. Alyssa L’Salle is a field agent with considerable experience in defusing tense situations, as demonstrated in the opening sequence where a terrorist attack upon a prominent skyscraper’s inhabitants is foiled through her quick thinking and expertise. Her next mission is an investigation into an abandoned laboratory where dangerous experiments were carried out and potentially useful information was stored. Success in this endeavor is not an uncategorical good thing for the solar system, as powerful forces desire the spoils found at the laboratory. Alyssa has no qualms about doing whatever it takes to prevent horrible things happening resulting from the wrong people getting this information, and fortunately she has allies to fight against nefarious forces. A lot of ground is covered in the Cosmic Star Heroine narrative, and multiple vignettes along the way feature interesting circumstances such as uncovering the true culprit in a murder for which Alyssa has been framed and attending a rock concert. Characterizations and story developments are inconsistently explored though, with larger beats in the narrative occurring without much information being presented. Certain characters join the action with very little time spent to get acquainted, and antagonists often get insufficient background to be fully intelligible. The world of this solar system could also use additional development to flesh out a number of the interesting aspects, though what is present suffices to keep the player grounded. Its effect in the middle of a sewage treatment plant is fortunately never depicted. Characterization happens as much through combat as through the narrative, because each battle member has wholly unique abilities. Fighting at first glance seems to be a standard turn-based affair with visible opponents, but quite a few tweaks to the formula have been applied. There are no standard attack or defend options; instead every character has up to eight distinct techniques for use. Except for a select few that specify being reusable, once these techniques are deployed they cannot be used again without taking a turn to recharge. Items are not only shared by the entire party but never vanish after application, with the caveat that they can only be used once during each battle. Each character’s arsenal of moves gradually increases through gaining levels, but since the number of techniques for battle is fixed at a maximum of eight the player will have to make choices about which are more important. The flexibility this provides along with frequently having a free hand in choosing Alyssa’s combat companions makes for a wide range of options to tackle any given battle. Such versatility matters even more because every battle is unique, and once it has been completed the adversaries do not return. Grinding is possible thanks to a means of replaying vanquished adversaries, but doing so bathes the screen in a harsh green and black display akin to night vision, possibly in an effort to discourage excessive use of the feature. Since each skirmish is unique quite a bit of thought went into differentiating them, and the player will need to pay attention to the distinct features of every encounter. Having the ability to change difficulty between battles ensures that anyone can get through the game. Enemies don’t pose much of a threat and go down quickly at the lowest setting, while careful thought and understanding of the mechanics is necessary to survive at the hardest. 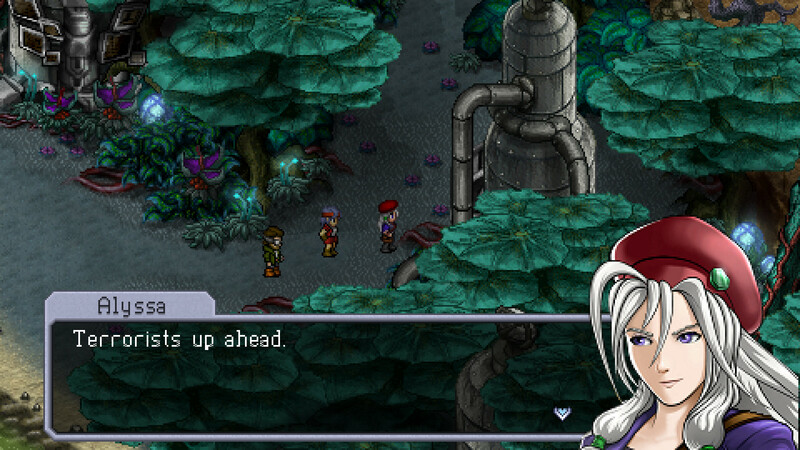 Fighting is one aspect of Cosmic Star Heroine that stays captivating throughout. Aside from needing to select the items that will be usable during battle, inventory management is fairly standard and uncomplicated. Effects of new materials are visible before they are purchased or equipped and the interface is effective. 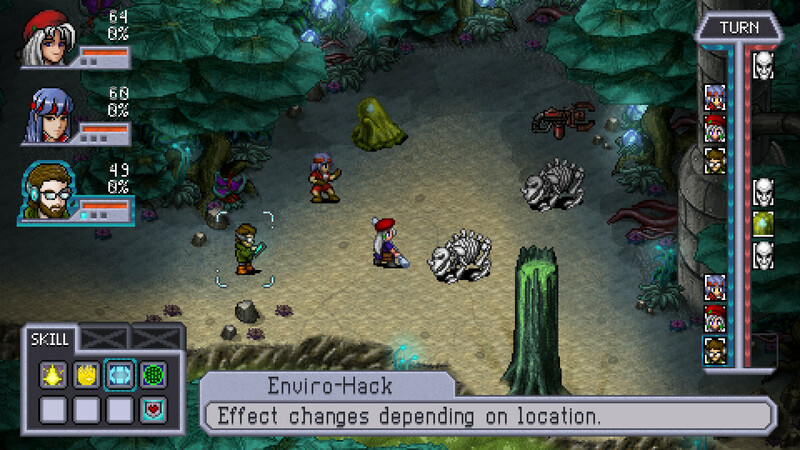 Cosmic Star Heroine does recommend players keep all possible shields on hand due to each model having unique special techniques though, even when the early types have outmoded defensive strength. 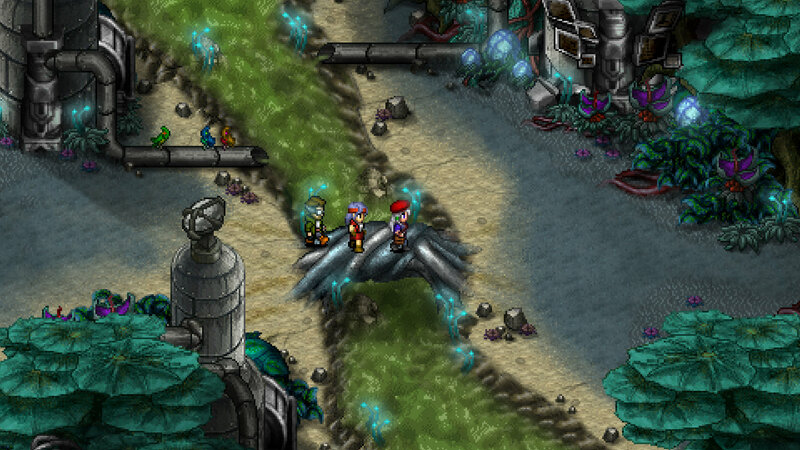 Zeboyd sought to create a title that would have fit in on 16-bit hardware, and in terms of its looks Cosmic Star Heroine achieves that desire perfectly. Its sprite and environment work demonstrates some rather more impressive things than developers usually achieved in the mid-1990s, though none of the animations go beyond the realm of possibility for what could have been done in that period. Certain character aspects are conveyed through the things their sprites do, and it’s an admirable effect. The one aspect of this title that involved people outside of Zeboyd Games is the soundtrack, which is quite varied for a relatively short title. Hyperduck Soundworks created the many tracks that will be heard, and while all of them aren’t equally catchy the experience never becomes unpleasant. Battle themes in particular are easy on the ears and don’t become aggravating after much repetition. Icky or pretty? All in the eye of the beholder. On the Vita Cosmic Star Heroine has been granted a couple of additional areas accessible near the conclusion, and these require complete understanding of the mechanics to survive even at the lowest difficulty setting. The Vita has also been granted some surprisingly long loading times between screens and an occasional delay when exiting the menu screen. Crashes were mostly ironed out of the game’s other incarnations and they’re uncommon on Vita, but as they can still occur the ability to save anywhere is very helpful. Akin to many of the titles it was inspired by, in particular Phantasy Star IV and Chrono Trigger, Cosmic Star Heroine does not engage in an unnecessarily lengthy adventure and can easily be completed in under twenty hours. I appreciated this reluctance to waste the player’s time because while my time with the game was mostly enjoyable, it didn’t spawn an immediate desire for replay. Cosmic Star Heroine doesn’t quite match up with the best of the 16-bit era’s RPGs but is definitely worth the attention of anyone today who was at all interested in the project during its long genesis, which is a lot more than many deliberate throwbacks can say. Glad to see my few hours into the game will be rewarded with the rest of it being as good. Thanks for the write-up!